There are only three pages left in the chapter! 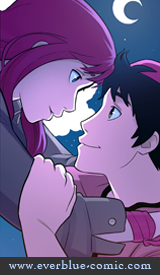 After they are posted we will need to take a two week break before posting Chapter Five; but I promise we will be posting some beautiful art provided by a bunch of lovely creators to make sure you have something nice to look at. It was announced two days ago that we will be guests of honour at PortConMaine in Portland. Maine. It will be out first time in the area. I hope to see some of you there in June! The Mix March Madness Webcomics Tournament has started their seeding round. Please vote for Amya to make sure we get in! We have a few updates to our Patreon special. The final 3 pages of Chapter 4 are now available to anyone who has made a pledge of 1$ or above. You can find them here. 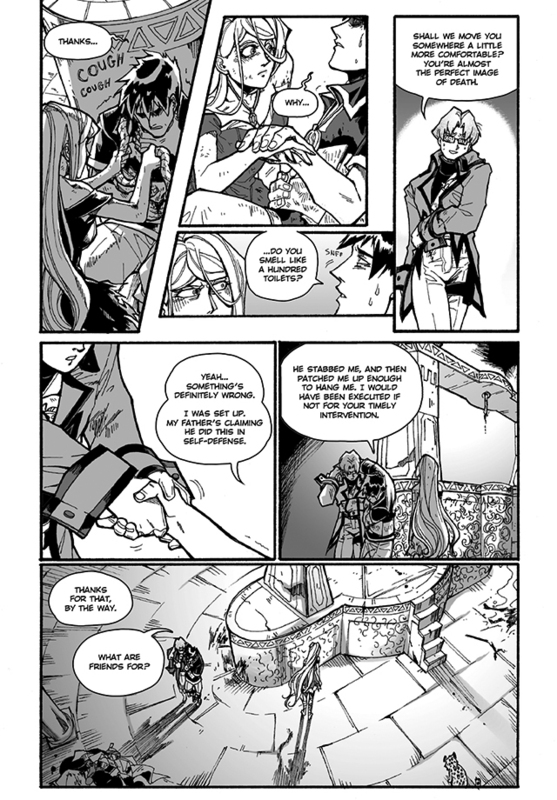 We have posted the first six pages of Chapter 5 for anyone who has donated 5$ or above. Thank you for all your lovely support, feedback, and conversations as usual! Standing there, maybe thinking, maybe upset, but still standing there mostly because you really really stink. Pff. You’re a tease too, Savvy. Makin’ me all curious and whatnot. I think magic-wielders there understand, for good or evil, “with great power comes great responsibility”. In other words, if you have it, you’d better be prepared to use it. Faye almost rolled for damage before, remember – but was stopped at sword point. She’s been ready, willing and able to use her gifts for some time. But we also have to remember, such people as she *really hate* by nature to do such things. They’ll do them to protect someone or something they *really value* (when they do, watch out) – but seldom otherwise. That look is priceless and amazing that Faye shot him. There’s an “I’d cuff you if you weren’t already at negative hit points,” to that look. Yes, but how would Accel know all that? :) Even in the last part of the battle, he had other issues to worry about (such as breathing). Perfectly legitimate question. Just not a tactful one. I suspect, too, that part of her annoyance stems from the fact that she can’t tell him all this because her stationery is pulp right now. She really needs to sit down with her friends and teach them sign language. Enough to function in conversation, at least. Has sign language been invented in this world? Yes! Faye uses it when talking to her sisters earlier in this chapter. On a historical note: sign language may in fact predate written language in it’s various forms. If nothing else, Plato mentions it in the Socratic dialogues, with a surprising level of respect. Funk dat noise. Legitimate my arse. He’s lucky I’m not Faye, After telling me I stink after saving his life, he’d be damned lucky if I don’t start cleaning the wound and suturing it up. Oh too bad, I only have lemon juice to pour over it, and these sutures that have been soaking in vinegar for a year. Oh well, got to make do when you smell like a hundred toilets huh? You wouldn’t think Diego would be aware of that and just LET himself get stabbed. You mean HE was framed to be charged with attacking good ‘ol dad, THEN get stabbed in “self-defense”, but in a highly expert fashion to keep him alive for this elaborate creepy stuff? But yeah, that line still doesn’t sound quite right. Where’s the self-defense for Accel? Didn’t seem he could do much off-screen after that stabbing pain in his chest, y’know. I’ll fix it when I get home tonight. I normally reproof the text before I post the page, but was short on time last night. It should reflect that he was framed; and never attacked himself. Sorry for the err guys! Well, Diego DID have chest/heart pains when he chased (and failed) to catch prey in the second movie. He did manage to overcome it at the end. Er…I mean Accel. Feel free to correct that if you can. Faye’s expression in that third panel is priceless. Currently Faye then has the power of Instant Ammonia: You shall Not go unconscious for any reason in her prescentce. Actually handy for Accel right now with the amount of blood loss he’s had.